Bloggin' 'bout Books: Clean, Quality Family Entertainment? You Gosh Darn Better Believe It! Clean, Quality Family Entertainment? You Gosh Darn Better Believe It! Finding clean, quality family entertainment is not easy these days. In fact, it's pretty much impossible. Which is why Studio C, a sketch comedy series produced by BYUtv, feels so refreshing. When I popped in the DVD of the show's first two seasons, which I received for review the other day, my kids (ages 15, 11, 9 and 5) came running. Literally. Even though they had already seen most of the episodes on the DVD, they gathered around and watched them again, laughing uproariously. For hours. When bedtime rolled around, they kept begging for just one more episode. That's how entertaining Studio C can be. 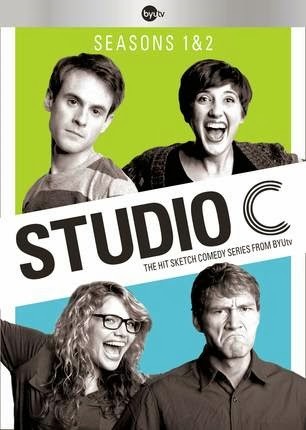 What is Studio C, exactly? Think Saturday Night Live with a smaller, younger cast presenting material you wouldn't be embarrassed to view with your toddler or your grandmother. The sketches parody everyday life in all its hilarious awkwardness. Although it's produced at BYU, the show does not talk about Mormonism at all—religion is only brought up in a very, very broad sense. Studio C was created to appeal to the general public. The hour-long program airs on Monday nights at 10 p.m. EST/8:00 p.m. MST. You can also watch it online at www.byutv.com/studioc . The first two seasons are also available now on DVD. You'll find all your favorite sketches and series, including "Just Jeremy," "Shoulder Angel," "The Awkwardness Avoidance Viking," as well as my personal favorite, "Captain Literally." Also included are outtakes from Season 2 and exclusive features. At around $20 (Deseret Book has the lowest price, $19.99), the DVD makes a fun, affordable entertainment that can be enjoyed by anyone. Just ask my kids! In the interest of providing you a fair and honest review of the DVD, I will say that because Studio C's cast is small, the sketches/characters do get a little redundant. And, of course, some of the sketches are funnier and more clever than others. For a low-budget show using non-professional actors, though, it does a pretty darn good job. How is it I never heard of this comedy series?? I'm sure my kids might have heard of it since they watch TV and I don't. You're right that it's hard to find good clean family entertainment. We love to watch episodes of Family Ties online and my kids love it. I will now look into this series. Thanks for posting about it!